New SMS feature - Receive realtime SMS’s of trades in your port zone of any grades you have on offer. Worried about counter party risk? - Never lose title of your grain until funds are received by the buyer with CGX's secure settlement. 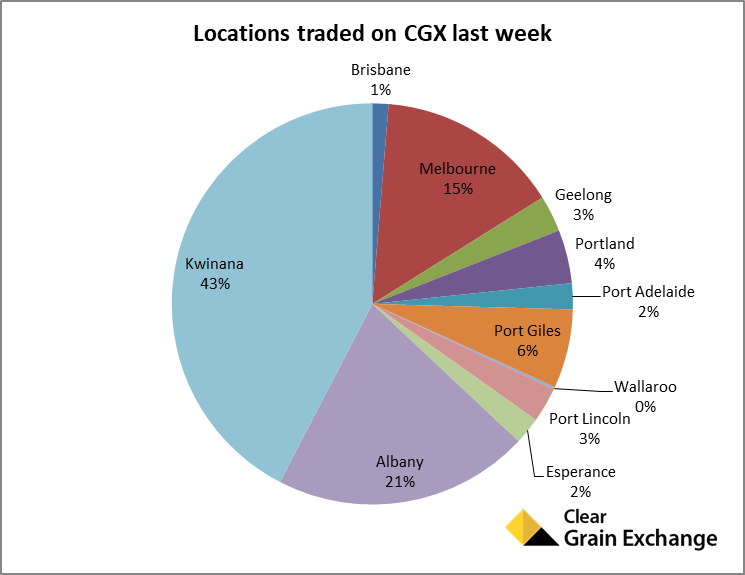 Another relatively diverse week for grain trading last week, although wheat in WA took up a larger proportion of trades this week. Again barley was in strong demand, particularly malt varieties through out Portland and Geelong zones, and Kwinana zone in WA. Buyers were again bidding strongly for canola throughout Victoria, resulting in solid trades above the best public numbers which is welcome news in the canola market at the moment. If you have an offer in the market and are looking to sell soon, adjusting your offer price closer to public bids and giving your offer time to attract demand is likely to be a more profitable strategy than being a forced seller at cash values. 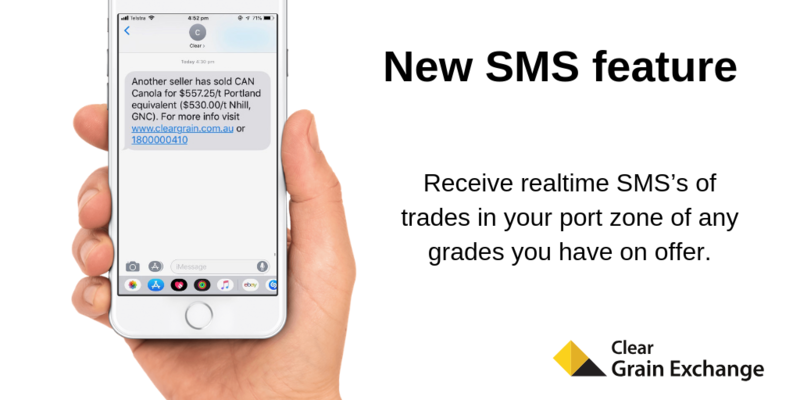 Receive realtime SMS’s of trades in your port zone of any grades you have on offer. This will keep you updated of nearby trading activity and provide you with REAL trade data so you can quickly make informed adjustments to your offers to give them the best chance of trading at your number. See below examples of trades last week well above the best public bids on the day. If growers didn't have their grain on offer, they may never had known it had the potential to trade at the price they wanted. There is no downside in having your warehoused grain on offer - It's free to offer and you can edit or cancel your offer at anytime before it trades. 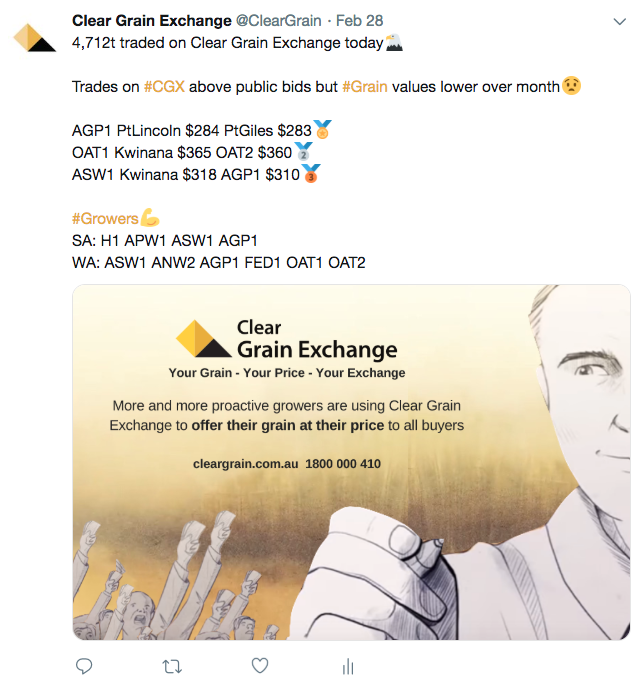 By having your offer out there on Clear Grain Exchange you will receive notifications of 'trades' of the same grade and location as your offer so you can monitor the real market (rather than public bids), and remember you are anonymous - so don't feel silly about putting your price out there no matter how optimistic it may be! See summary charts of last weeks trades below. If you would like more detail on what has traded please click the recent trades link below or feel free to call the CGX team or your Authorised Agent. 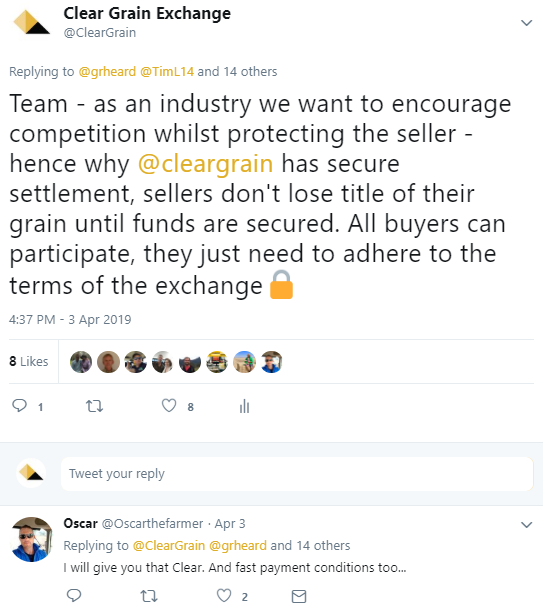 Once your grain trades in Clear Grain Exchange (CGX), the secure settlement process ensures you do not lose title of your grain until the buyer has paid. This secure process is facilitated by an independent custodian so CGX never has ownership of grain or the funds, making CGX one of the most secure ways to trade your grain. And the best part is this secure process all occurs within a maximum of 7 business days! All industry levies and end point royalties are automatically deducted and a trade settlement notice delivered simultaneously. CGX prides itself as an industry leader in efficient and secure payment. Click here for more information or call us on 1800 000 410. You can now conveniently re-offer your expired or cancelled offers via the My Offers tab by selecting “Closed” from the Offer Status drop down menu. This feature was developed from feedback by users and will greatly improve efficiency of re-offering and help mitigate against making errors. We encourage you to make the most of it and thanks for the feedback! There is no downside in offering your grain on CGX! 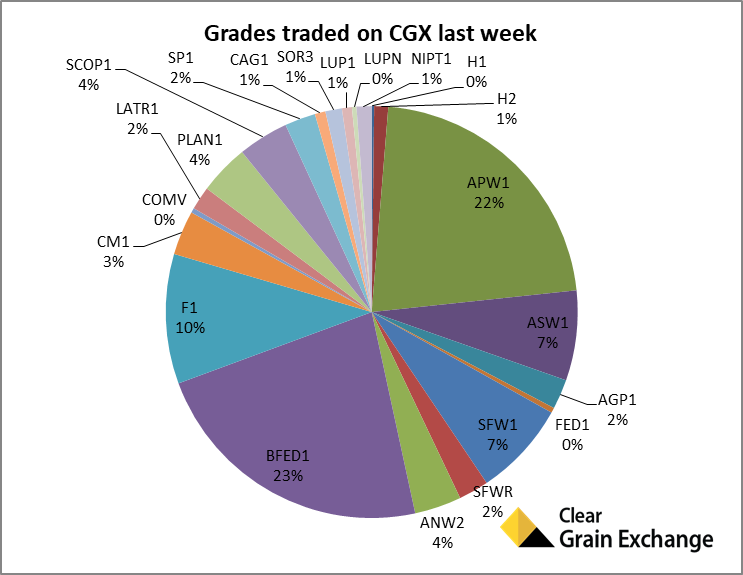 Free to register and free to offer your grain on Clear Grain Exchange. You can edit or cancel your offer at any time for free before it trades. A trade can only occur at the price you put on it (or higher), your offer is exposed to all buyers and if your grain trades you are protected by a secure settlement process that ensures you don't lose title of your grain until you are paid. Therefore as long as you are happy with the price and amount of grain you put on offer, there is no downside in giving the exchange a go! You can also authorise your trusted grain-marketing professional to act on your behalf on the exchange. 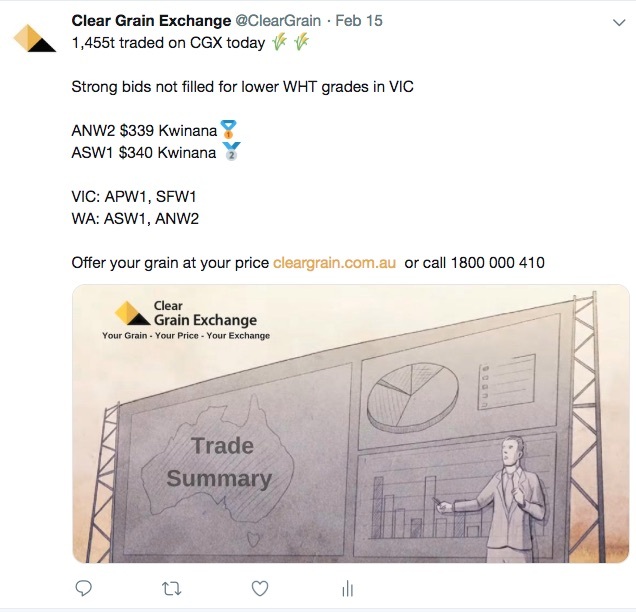 If you need help registering a Clear Grain Exchange account or offering your grain, please don’t hesitate to contact the CGX team on the details below or your Authorised grain marketing professional. 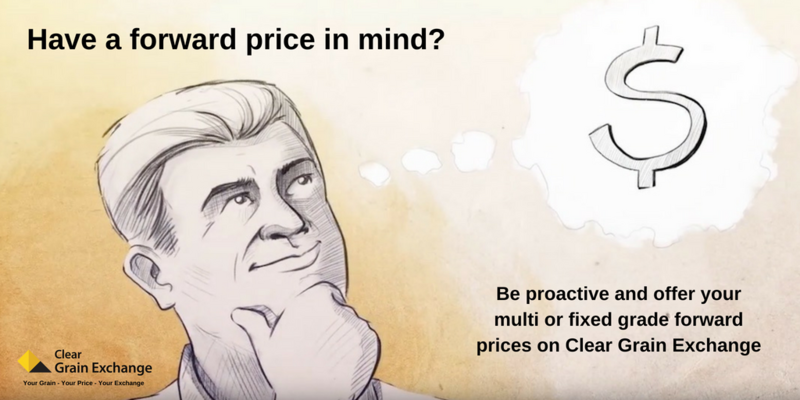 Clear Grain Exchange is an independent online platform where grain sellers can offer their grain, at their price, in an open market to all buyers. If the grain trades, a secure settlement process ensures sellers don't lose title until they're paid, within 7 days. Grain buyers benefit from more efficient accumulation given they are able to view parcels of grain ready for sale in a firm and live market. The exchange also ensures a robust paper trail of all orders and transactions. At time of settlement, appropriate levies, end point royalties, and any applicable fees associated with the storage provider are deducted, cutting down the paperwork into one simple transaction. Our aim is to foster competition at the farm gate and ultimately improve returns by creating an efficient market where all supply chain participants benefit. 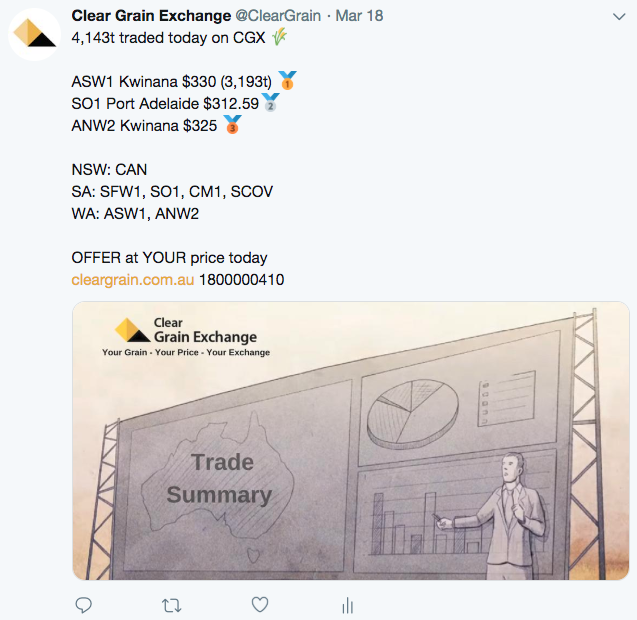 Think of Clear Grain Exchange as the share market for Australian Grain. CAUTION: This email, and any files transmitted with it, may be confidential and may also be legally privileged. If you are not the intended recipient, any use, review, dissemination, distribution or reproduction of this message, or its attachments, is prohibited. We accept no responsibility or liability for viruses or anything similar in this email or any attachments. If you have received this email in error, please notify the sender immediately and destroy the original message. Any information in the content of this email or attachments is general in nature without regard to any individual objectives, financial situation or needs. We exclude, to the fullest extent permitted by law, all liability for any loss or damage of any kind however rising in relation to this information, including any reliance on it or making any transaction in connection with any information or strategy mentioned in it. Don't want to receive emails from Clear Grain Exchange? Tonnes traded in March averaged $9.27/t above best public bids - and all settled safely and securely. Create demand with your offer! 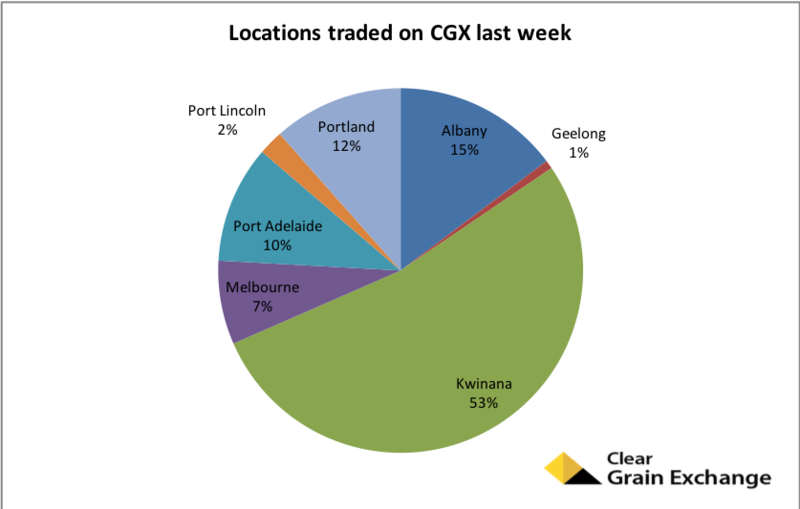 A diverse week for grain trade last week with canola finding strong demand in Victoria, barley trading strongly in SA and WA, lupins and oats trading in WA, and wheat finding homes in all parts of Australia. Did you know you can offer new season grain on CGX? 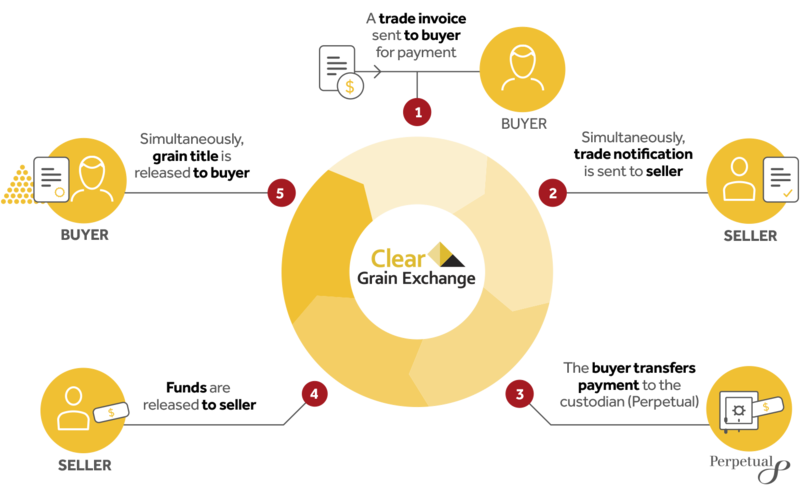 Clear Grain Exchange allows sellers the ability to secure a target price today for grain they are going to deliver in the future. It's easy to create, edit and cancel forward offers in real time, free of any charges, ensuring you remain in control. Offers in the market are viewable to the approved buyers on CGX. 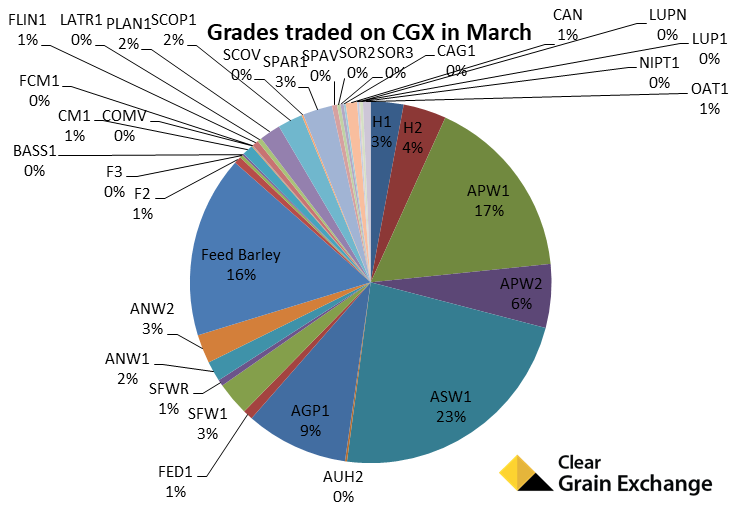 March saw a lift in demand for grain - tonnes traded on CGX in March averaged $9.27/t above the best advertised public bid. 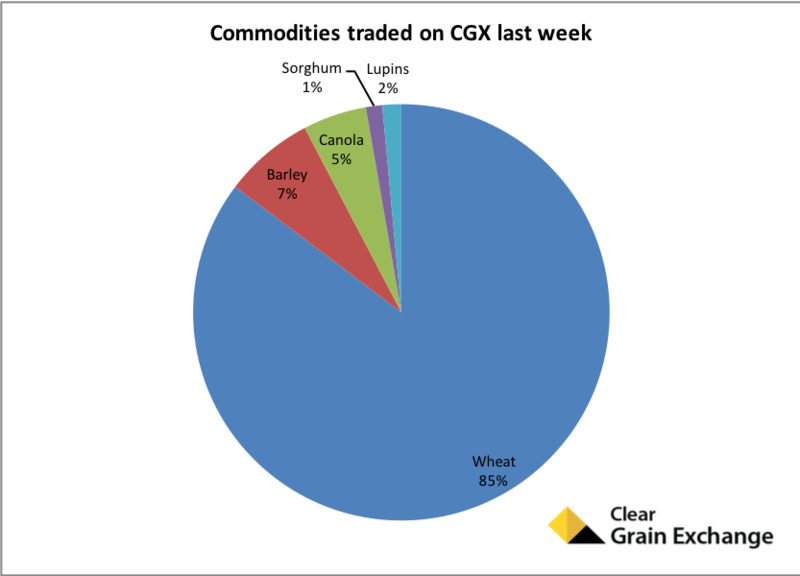 25 buyers bought grain on CGX in March - more were searching but not finding parcels they could make work. Create demand with your offer! March saw an increase in volatility in grain values on the back of demand with buyers actively searching for grain on offer. The increase in demand resulted in a halt to the decline in grain values seen through February and a lift in values for many grades. 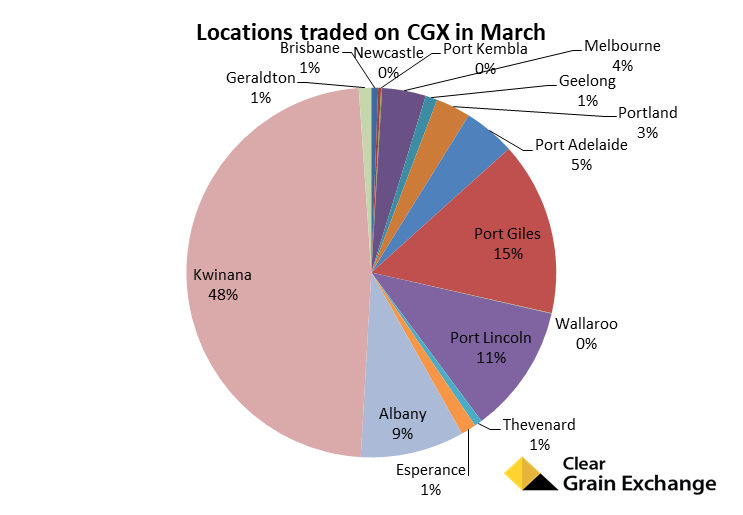 Tonnes traded on Clear Grain Exchange in March averaged $9.27/t above the best advertised public bid on the same day. 25 buyers participated in buying grain on the exchange with more searching for offers to buy but not finding grain they could make work. Wheat was the dominant commodity traded making up 70% of all trades in March followed by barley (27%) and sorghum, canola, lentils, lupins and oats making up a combined 3%. The extra demand was likely sparked by a revival in CBOT wheat futures, domestic users wanting to source more grain since their harvest accumulation, a very dry March around Australia, and reports of some export business. Reports of the ex-farm market trading well above bids advertised at storage sites is also keeping growers on their toes. Often growers with grain in warehouse are doing their numbers and offering warehoused grain at equivalent values to their ex-farm (ie. accounting for warehouse in-out costs etc) - and often getting it traded. This is likely why many parcels of grain on offer are trading at better values than advertised public bids. If you have an offer in the market and are looking to sell soon, adjusting your offer price closer to public bids. Giving your offer time to attract demand is likely to be a more profitable strategy than being a forced seller at cash values. 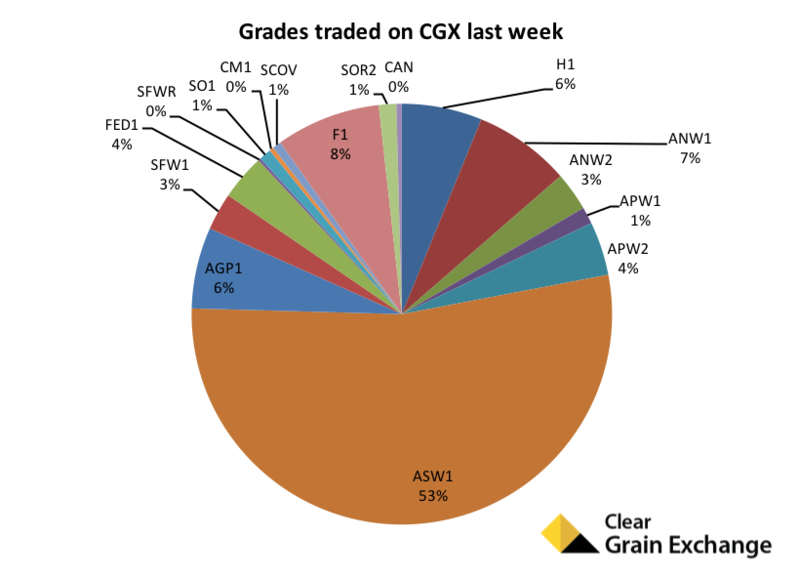 Buyer engagement holding after recent lift - 15 buyers bought 16 grades on CGX last week. Growers getting benefit from their offers - have your offer in the market and receive SMS notifications of 'trades' of the same grade and location. Worried about counter party risk? - Never loose title of your grain until funds are received by the buyer. Public indicative bids have been holding for the most part of last week, with pockets of solid demand in certain areas with buyers willing to jump up to purchase grain. 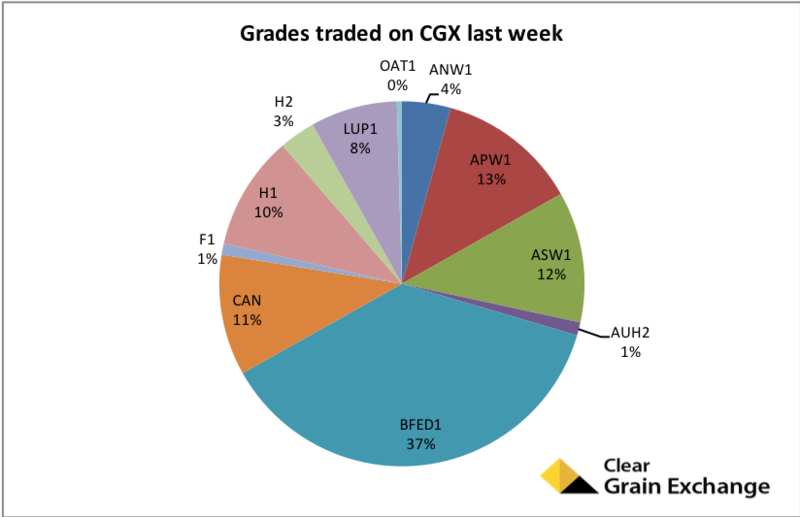 16 grades trades traded last week which was down from 22 the week prior, although buyers can only purchase what they can see on offer so it may just be that there was less variety of grades in reach of buyers last week. This is why it is important to have your offer out there as you will receive notifications of 'trades' of the same grade and location as your offer so you can monitor the real market (rather than public bids), and remember you are anonymous - so don't feel silly about putting your price out there no matter how optimistic it may be! Once your grain is on offer at your price you can then start to think about when you would like to sell your grain. By giving your offer sufficient time in the market in front of all buyers it will allow you to test out the market at certain levels above current public prices. If your circumstances change and you would like to get your offer sold then adjust your offer closer to recent trades or the public number. The closer your offer is to recent trades or the best public bid ( +$10/t or +$5/t), the more likely it is to sell quickly. You are protected by anonymity and secure settlement on Clear Grain Exchange so no price is a silly price! It's free to offer and you can edit or cancel your offer at anytime before it trades. Buyer engagement continues to lift - 16 buyers purchased grain on Clear Grain Exchange last week (up from 14 the week prior). 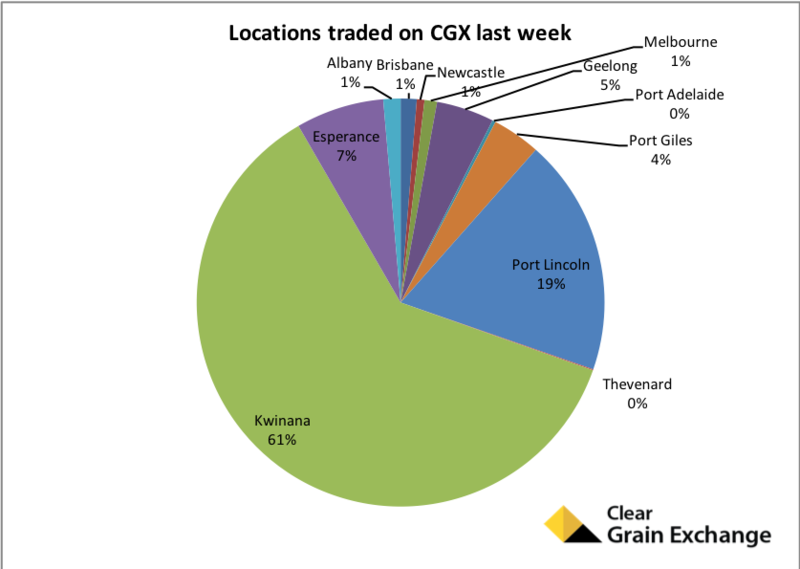 Still a disconnect across grain markets - remains very dry in eastern Australia, farm-to-farm trading at different values to delivered site equivalent(ish) values, sellers with higher price expectations than buyers. No price is a silly price - it's free to offer and you can edit or cancel your offer at anytime before it trades. Give it a go! The recent lift in buyer engagement in grain markets continued last week with 16 buyers purchasing grain on the exchange (up from 14 the week prior). This created volatility in grain values as buyers searched and bought on Clear Grain Exchange at levels better than advertised public bids. There were more buyers searching for grain on offer to buy but not finding grain they could make work. 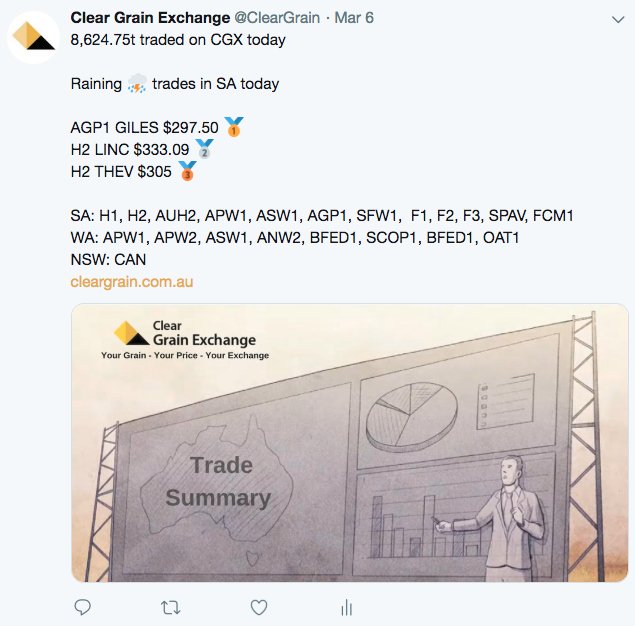 Ultimately there still appears to be a disconnect across grain markets as Aussie dry conditions continue to put pressure on grain growers and end-users. Farm-to-farm trading is reportedly relatively active as growers look to cover feed requirements with some trades occurring ~$30/t above equivalent(ish) delivered site values as numerous up-country locations up and down the east coast. Volumes are not huge however it is hard to argue with why a grower with grain in warehouse wouldn't have higher price expectations than those posted on the boards at those sites. Perhaps more growers should be considering buying grain stored in warehouse? For sellers with grain in warehouse, work out what number you would sell at and offer your grain at that price - regardless of whether you think it will trade. If you don't have your grain on offer, you won't know if it has a chance to trade at the price you want. Profarmer reports that CBOT wheat has had a little rebound after reaching the lowest levels for 13 months. 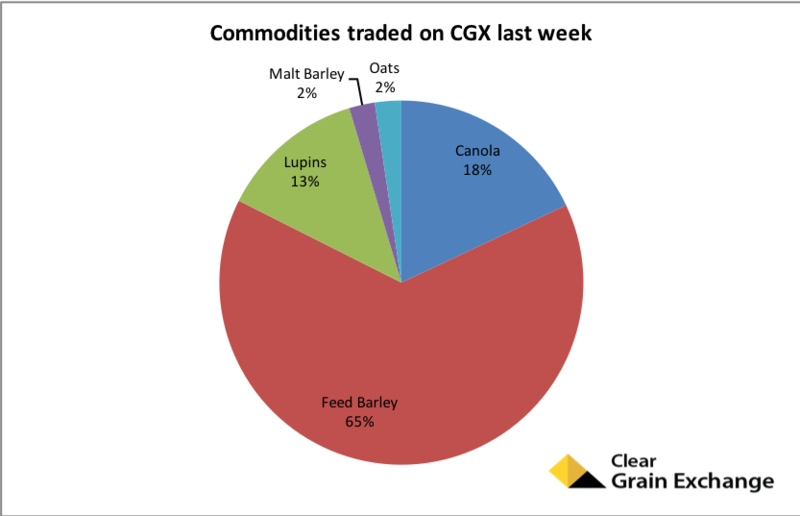 Buyers return creating volatility/opportunity - 14 buyers bought through CGX last week with more searching but not finding grain they could make work. 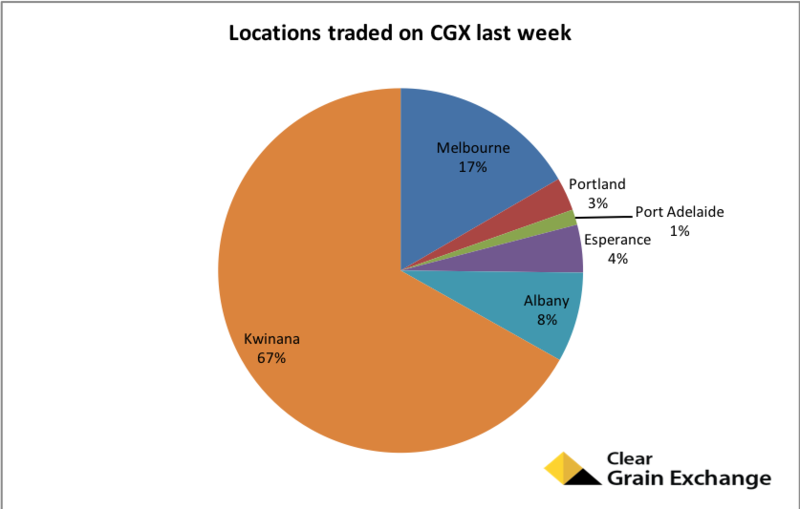 SA and WA the focus of demand - SA and WA made up 50% and 48% respectively of all trades on CGX last week with trades well above publicly advertised bids. Demand can be hard to predict - so give yourself the best chance of participating in it when it exists by offering your grain at your price to all buyers. 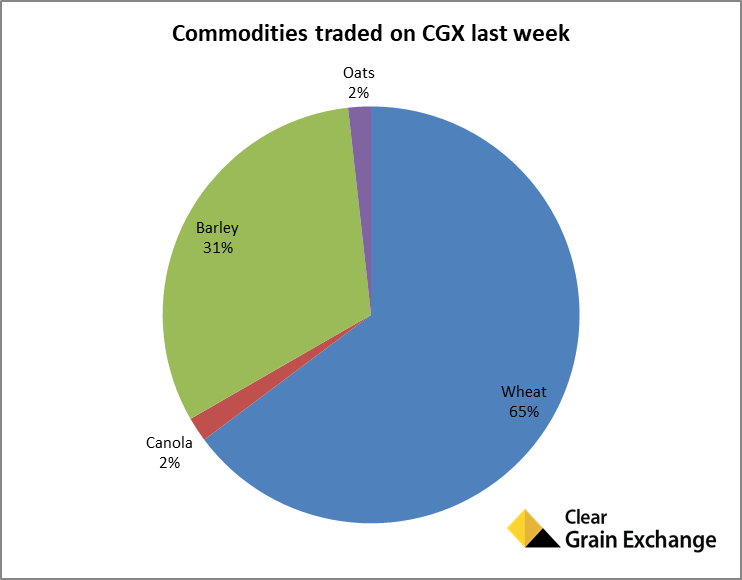 Last week saw volatility in grain values as buyers searched and bought on Clear Grain Exchange at levels better than advertised public bids. 14 buyers participated in buying grain on the exchange with more searching for offers to buy but not finding grain they could make work. The engagement was a good way to begin March after February saw values decline significantly with reports immediate demand had been covered and buyers were seemingly happy to step aside whilst CBOT wheat pushed lower. 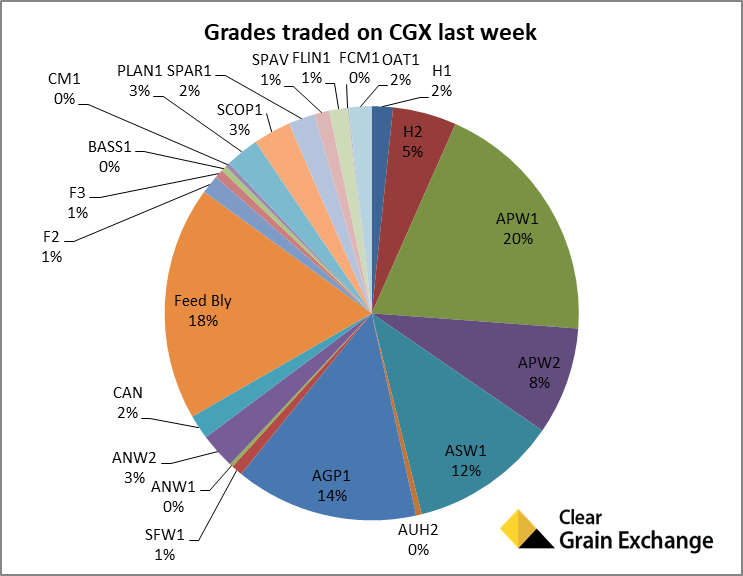 The breadth of demand was also good last week with most grades of wheat and barley attracting attention. Milling and noodle wheat grades, feed and malt barley grades, oats and canola all traded strongly. Interestingly the export focused areas of Australia were where the demand picked up. 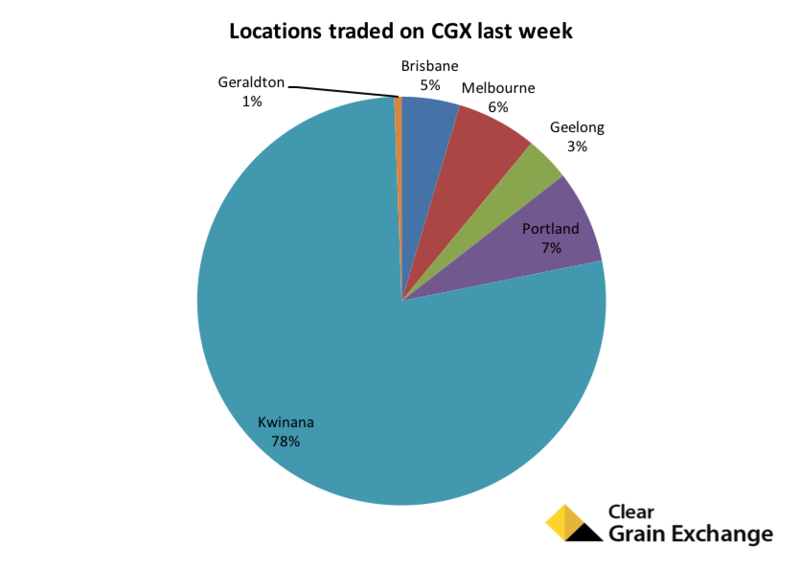 SA and WA accounted for 50% and 48% of all trades last week respectively. Perhaps grain values have done enough work to the downside in February to buy further demand? Or maybe the recent lift is on the back of immediate shorts? Or is the market recognising the dry outlook in the eastern states for the first part of the year? Demand can be hard to predict, so give yourself the best chance of participating in it when it exists by offering your grain at your price in the open exchange so all buyers can see it, crunch their numbers and try to buy it. You are protected by anonymity and secure settlement so no price is a silly price! It's free to offer and you can edit or cancel your offer at anytime before it trades. If you don't have your grain on offer, you won't know if it has a chance to trade at the price you want. Profarmer reports CBOT wheat is now at the lowest levels for 13 months. What price do you want for your grain? 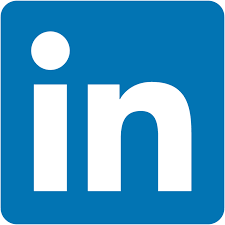 When do you need to sell by? Eyre Peninsula SA makes up 57% of all trades - All grades of wheat were strongly bid and trading at values well above public bids. Keep an eye on your offer and the market - Adjust your offer in line with your cash-flow needs and the market as required. Public indicative bids have fallen considerably over the last month across many grades of grain, however this does not necessarily mean there are not buyers out there willing to purchase grain at your price. 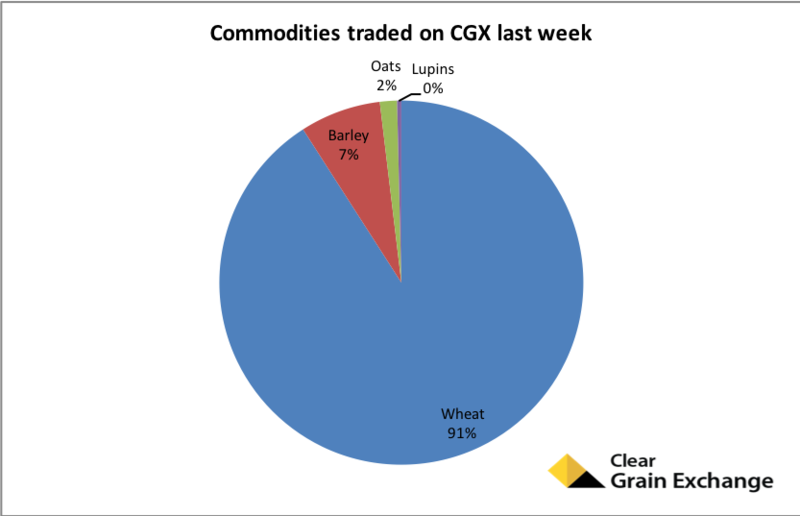 There should be no downside in growers offering their grain at their price on CGX regardless of how the public indicative market prices are performing. If your answer to the first question is '$400/t' and your answer to the second question is 'not in a hurry' then offer at $400/t. By having your offer out there you will receive notifications of 'trades' of the same grade and location as your offer so you can monitor the real market (rather than public bids), and remember you are anonymous - so don't feel silly about putting your price out there! Once your grain is on offer at your price you can then start to think about when you would like to sell your grain. By giving your offer sufficient time in the market in front of all buyers it will allow you to test out the market at certain levels and take advantage of unforeseen opportunities which may not line up with current trends in public prices. If your answer to the second question is 'very soon' or if your circumstances change and you would like to get your offer sold then adjust your offer closer to recent trades or the public number. The closer your offer is to recent trades or the best public bid, the more likely it is to sell quickly. The last thing you want to do is cancel your offer which is +$100/t above trades or public bids to hit a cash number when the market has not been tested at +$10/t or $5/t above public numbers because you did not adjust your offer. So far this season trades on CGX have averaged more than +$6/t above the best public bid of the day for the same grade/location. Last week saw a focus on South Australia by buyers with 57% of all trades occurring on the Eyre Peninsula. Most wheat most were sort after with particular attention being paid to H1 and ASW1 and lower. AGP1 again was particularly sort after in Port Lincoln zones with Cummins trading +$18 above the best public site price on the day. If this offer had not been in the market to begin with, no one would have know this demand was there. 9 buyers participated in buying grain on the exchange last week with more searching for offers to buy but not finding grain they could make work. Hence offer your grain at your price in the open exchange so all buyers can see it, crunch their numbers and try to buy it. Trade values holding against falling public numbers - Many trades on CGX were well above public numbers despite the downward trend continuing. 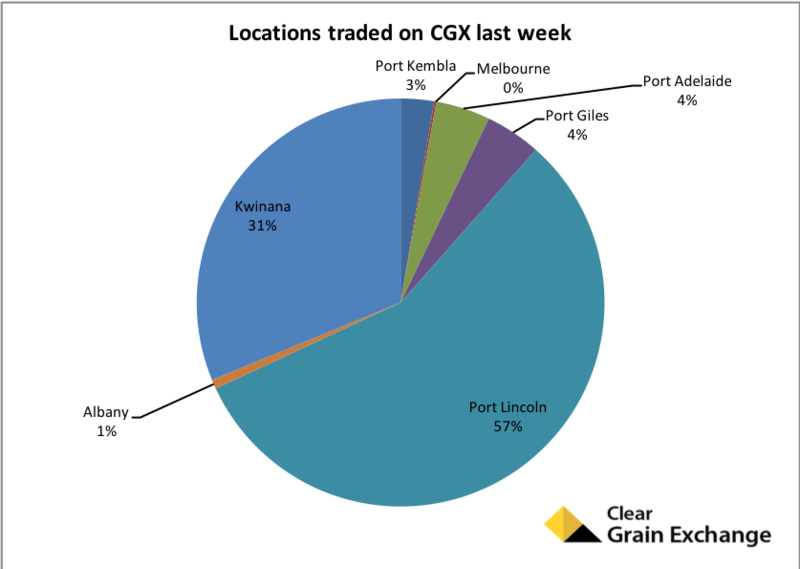 Buyers searching for grain throughout Australia - 11 port zones traded last week across WA, SA, VIC, NSW and QLD, up from 4 zones the week before. Generally public grain values continued to grind lower through last week with some support later in the week creating some opportunity. In some cases buyers were trying to buy grain on the exchange well above public numbers which shows that the public number is not always representative of where buyers are willing to buy. Some sellers with offers in the market who needed cash flow adjusted their offers closer to bids to try and attract demand rather than cancelling their offer and hitting a bid, and were picking up an extra few dollars as a result. Last week saw a big jump in the breadth of zones trading with 11 port zones throughout Australia trading, up from 4 zones the week before. This shows that buyers are happy to engage in most areas at the moment. 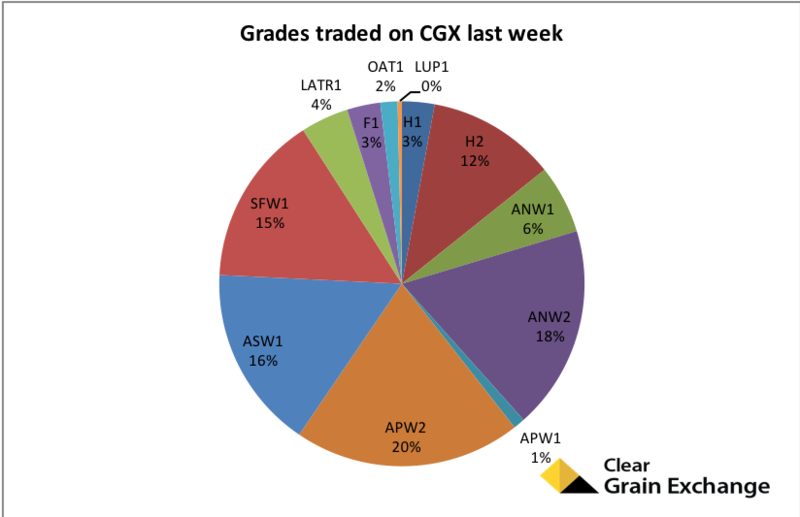 Wheat was most in demand with 85% of trades which was dominated by ASW1 and AGP1 grades throughout Western and South Australia. AGP1 was particularly sort after in Port Lincoln zones with Cummins +$26 above the best public site price on the day. If this offer had not been in the market to begin with, no one would have know this demand was there. ASW1 wheat values declined in the west last week with trade values also declining but maintaining a healthy premium to public bids on the way down. This looks to be in-line with the decline in CBOT wheat futures however we wonder whether that is reflective of physically traded values? Barley attracted some demand in Western Australia. Malt grades PLAN1 traded Albany for $292 FIS. Buyers were searching for sorghum offers though Queensland, however were struggling to find offers. Generally the stand-off in the market continues as growers hold offers at higher levels and demand has a softer tone for the time being. Despite this pockets of demand resulted in buyers posting strong bids versus the best public bid which shows you never know what is going on behind the scenes. 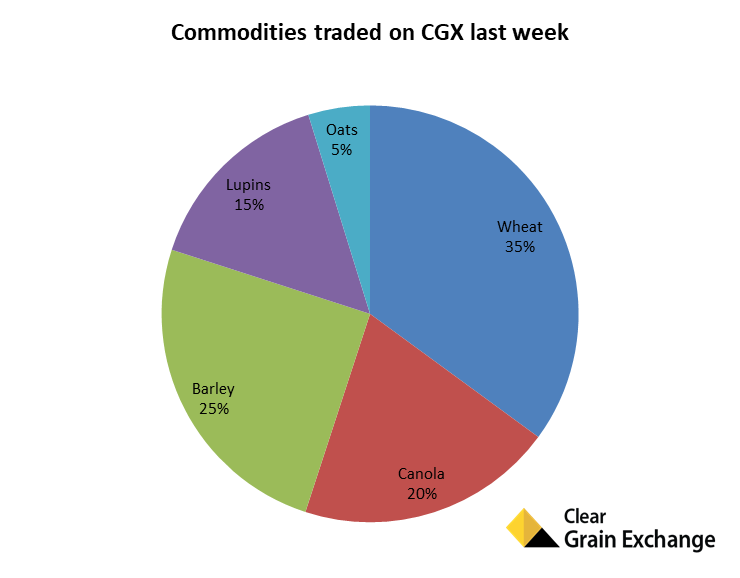 12 buyers participated in buying grain on the exchange last week with more searching for offers to buy but not finding grain they could make work. Pockets of demand - Buyers targeting specific grades/locations, 11 buyers purchased grain last week with more searching. Demand is hard to predict - It's a tough market. Offer your grain at your price in the market to take advantage of demand when it arises. The market continued to track sideways last week with pockets of strong demand for specific grades in certain locations trading above the best public number. 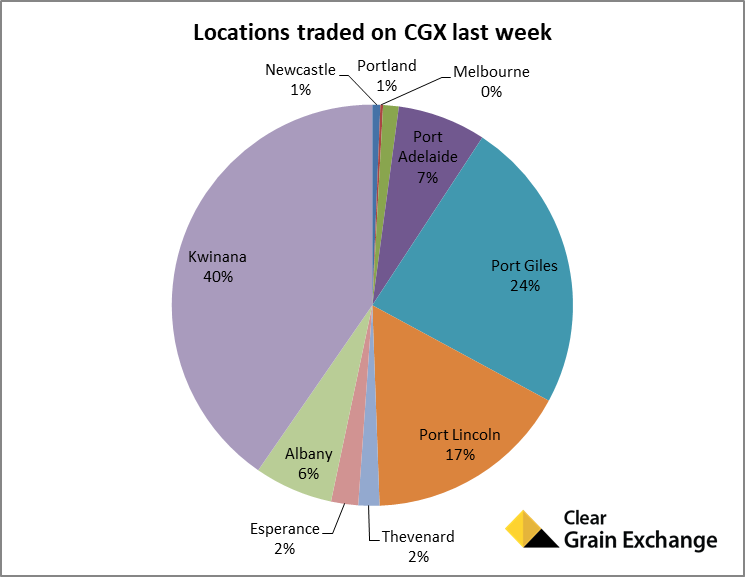 Wheat made up a large percentage of trades (91%) with high protein grades trading at solid numbers in Kwinana and Port Adelaide zones. ASW1 was also keenly sought after in the west. 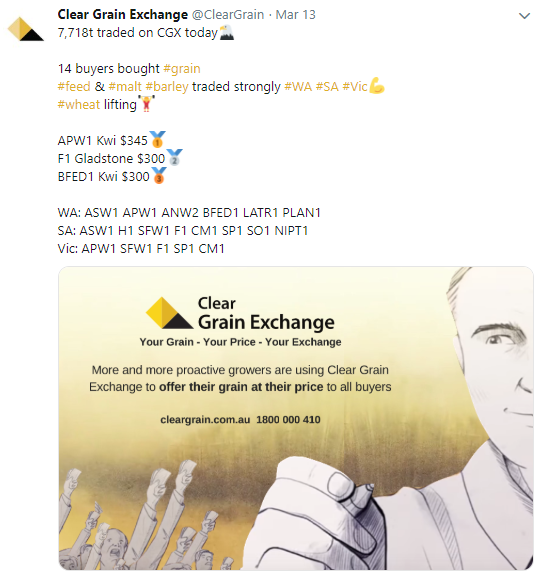 At the other end of the spectrum SFW1 and AGP1 wheat was sort after in Victoria with strong trades and bids being placed throughout the Melbourne zone. 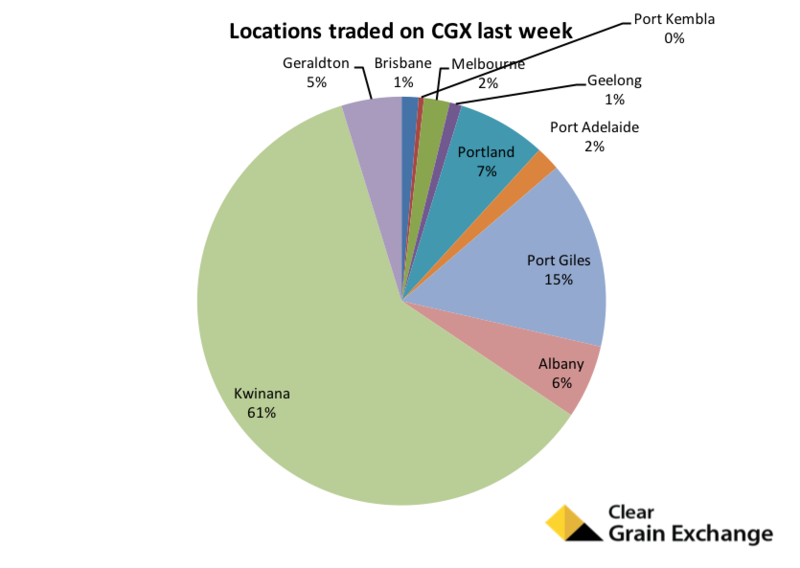 Barley represented a much smaller proportion of total trades than the previous week although buyers were chasing feed barley in the Portland zone with trades going through well above best public numbers at a port level of $372/t. 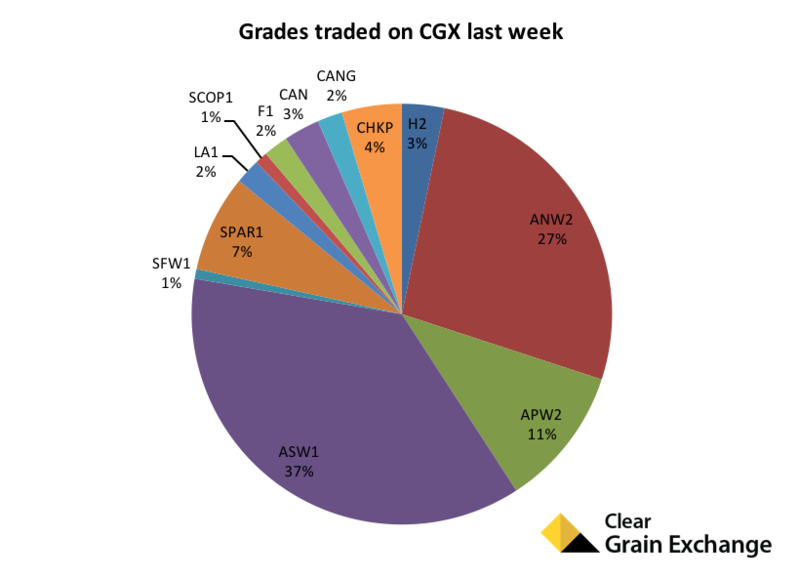 11 buyers participated in buying grain on the exchange last week with more searching for offers to buy but not finding grain they could make work. Grain markets track sideways - with public bids generally remain at lower levels than harvest. Buyers targeting specific grades/locations - 11 buyers purchased grain with more searching. Demand is hard to predict - Have your offer in the market to take advantage of demand when it arises. Keep an eye on your offer and the market - Adjust your offer in line with the market. Last week's market largely tracked sideways although we are still seeing strong demand for specific grades and locations and trades going through above best public numbers. 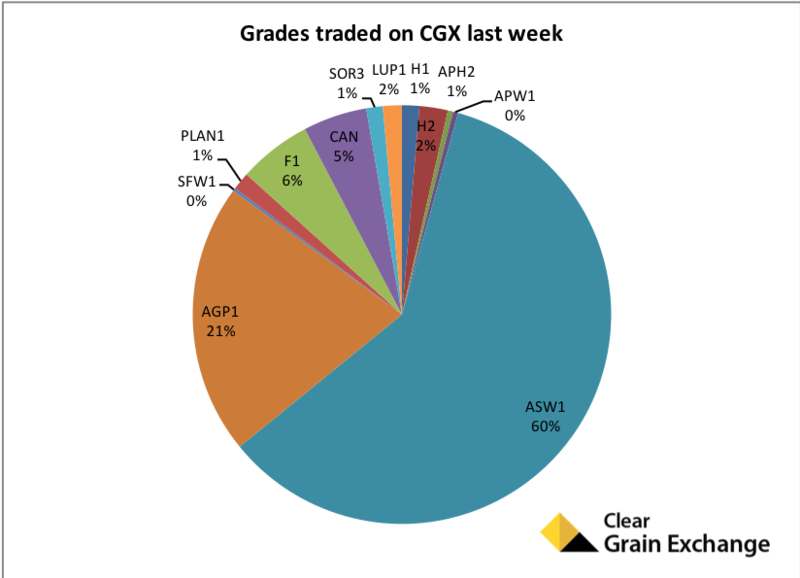 Buyers were chasing high protein wheat grades particularly in Western Australia. Canola demand picked up in South Australia with buyers targeting specific locations such as Bowmans and Roseworthy. 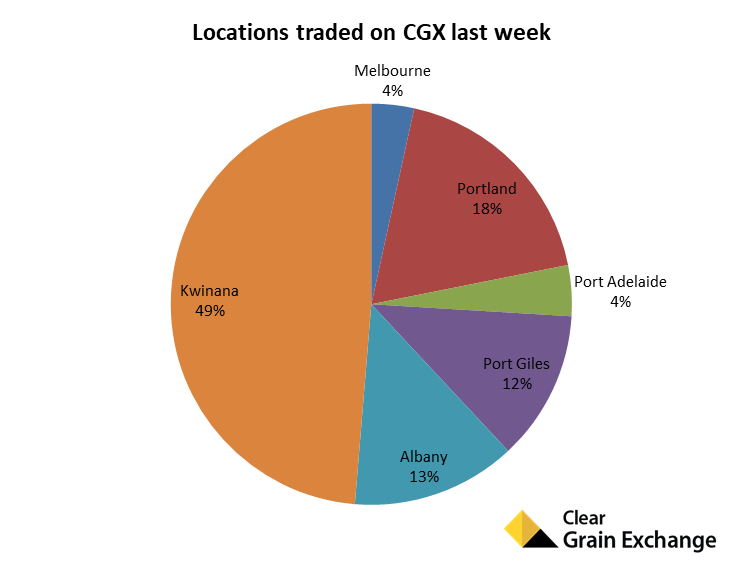 Feed barley saw a jump in trades in Kwinana and Albany and represented 65% of this weeks trades, interestingly barley only represented 2% of the previous week's trades. Despite the general stand-off conditions, buyers were showing strong appetite for specific grades in specific locations at times throughout last week. This resulted in buyers posting strong bids versus the best public bid which shows you never know what is going on behind the scenes. A reminder if you have an offer in the market and are looking to sell soon, adjusting your offer price closer to public bids and giving your offer time to attract demand is likely to be a more profitable strategy rather than being a forced seller at cash values. 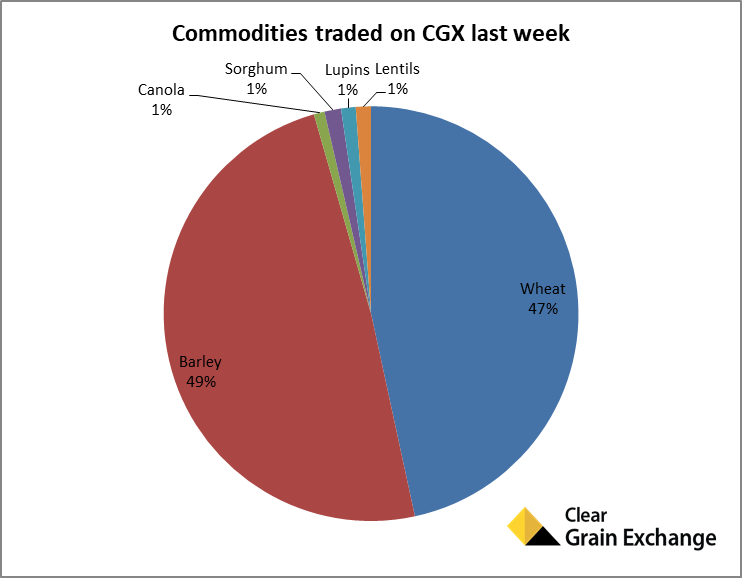 11 buyers participated in buying grain on the exchange last week with many more searching for offers to buy but not finding grain they could make work. Hence offer your grain at your price in an open exchange so all buyers can see it, crunch their numbers and try to buy it. 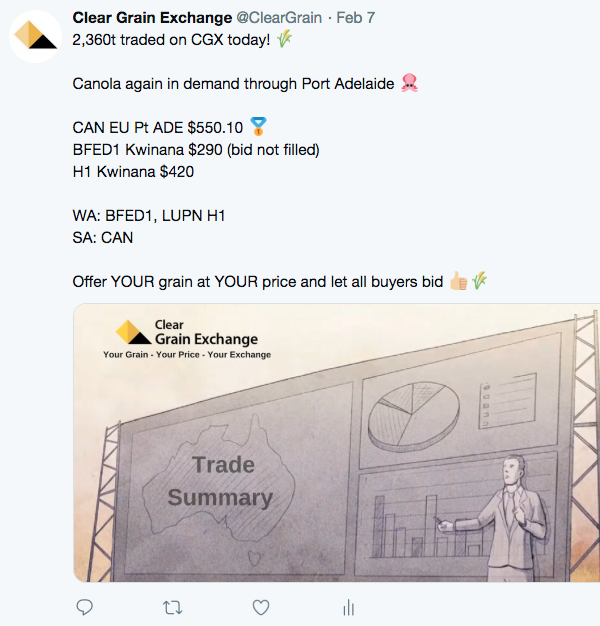 Offer your grain at your price in CGX to create demand for your grain - if you don't have it out there you won't know if it has a chance of trading!